Paul Cook is still actively looking to strengthen his Wigan Athletic squad ahead of next Thursday’s transfer deadline. But he admits progress has been slower than hoped in the ‘notoriously difficult’ January window. Cook snapped up forward Anthony Pilkington on a free transfer from Cardiff City at the beginning of the month. However, he has been frustrated in his attempts to add reinforcements to his midfield and defence. “January is a notoriously difficult window for football clubs in general,” Cook acknowledged. “I think it’s pretty common knowledge we are looking to strengthen, that is key. Cook has already confirmed his interest in Nottingham Forest’s Danny Fox and Aberdeen’s Graeme Shinnie. And the Wigan Post understands a proposed swoop for Reading’s Tyler Blackett remains a possibility. It could also be a busy final week of the window in terms of outgoings, although there has been no fourth Sunderland bid as yet for Will Grigg. The striker damaged his right ankle during the closing stages of Saturday’s 1-0 defeat at Sheffield Wednesday. However, it’s believed the injury isn’t as serious as originally feared - certainly not bad enough to cause Sunderland to look elsewhere. There could also be movement for the likes of Alex Bruce, Shaun MacDonald and Jordan Flores, who are all out of contract at the end of the season and looking for game-time. Flores has been stronly linked with a move to Dundalk in the League of Ireland. Leonardo Da Silva Lopes could also be set for a loan move to secure first-team football, although that would depend on Cook being able to add bodies to his squad first. Meanwhile, Latics’ Development Squad enjoyed a 6-0 romp against Mansfield in the snow at Christopher Park on Tuesday afternoon. Striker Joe Piggott was the hero with a hat-trick, the first of which came from the penalty spot on 18 minutes. 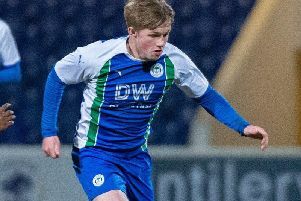 Oliver Crankshaw doubled the Latics lead 10 minutes before the break, before England youth star Joe Gelhardt made it three on the stroke of half-time with a fine finish. Piggott made it 4-0 midway through the second period, and late goals from Charlie Jolley (83) and Piggott (85) completed the rout.